Goosepool or RAF Middleton St George airfield opened as a Bomber Command station in 1941. After the war, the aerodrome served various squadrons and units but the RAF left the station in 1964. Two years later, the aerodrome was reopened in 1966 as a civil airport. The airfield was named Teesside International Airport in the 1960s. We were asked to investigate the possibility of developing a motor racing facility and associated industrial development on vacant land and former runways to the east of the operational airport. Designing an interesting track with reasonable viewing and shelter for spectators is difficult on airfield sites but this layout overcomes many of these problems and works well with existing landscape features. 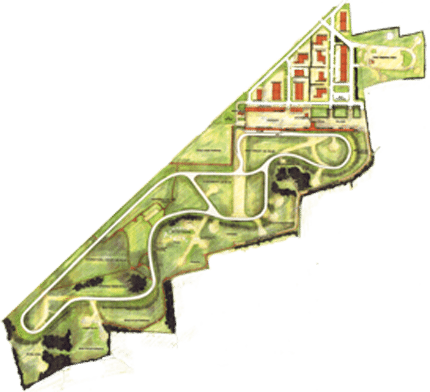 The Teesside International Circuit proposal included a 1.6 mile club circuit, a kart facility and rallycross course.